Engineered specifically for 2018 Ford Mustang 5.0L V8 models, K&N® 69-3540TP and 71-3540 air intake systems provide a guaranteed increase in horsepower and torque for Mustang devotees. The 69-3540TP system (Typhoon® series) features a washable, reusable High-Flow Air Filter™, an aluminum tube design, and steel heat shield—while the 71-3540 (Blackhawk Induction™ series) includes a non-oiled synthetic DRYFLOW® filter, a black powder-coated tube, and steel heat shield. Either system will give you a guaranteed increase in horsepower and exceptional engine protection. If you want to give your Ford industry-leading engine protection and an increase in power, check out the 69-3540TP and 71-3540 performance air intake systems—specifically designed to fit in the engine bay of 2018 5.0L V8 Ford Mustangs. Both the 69-3540TP and 71-3540 systems are designed to help keep engine air cooler (which can increase engine combustion efficiency), and provide a smooth, low-restriction path for airflow to the engine. Many stock intake systems have airflow-obstructing components that can create turbulence—and heat as a result—making engine combustion less efficient. By replacing the complete factory system with an aerodynamic tube and low-restriction filter, your engine will have access to a higher volume of cool air—giving you a guaranteed increase in horsepower and torque. 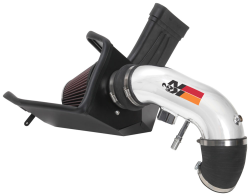 The 69-3540TP and 71-3540 intake systems feature mandrel-bent aluminum intake tubes, which are engineered to reduce turbulence in the air and help keep engine air cooler—and increase engine performance! Both systems also incorporate a steel heat shield, which helps protect the air filter and intake air from high engine temperatures. 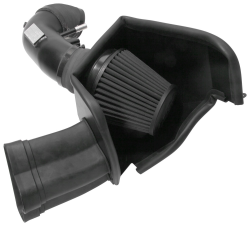 The High-Flow Air Filter™ included in the 69-3540TP intake kit is oversized with a conical shape, providing a greater surface area and allowing for a service interval of up to 100,000 miles between cleanings (under normal highway driving conditions). High-Flow Air Filters feature an oiled, layered design—providing up to 50% more airflow than a traditional paper filter. When your filter does need to be cleaned, you can use the K&N Recharger® Kit (99-5000 or 99-5050) to quickly and easily restore your filter’s performance. Each K&N intake (and filter!) is designed to last for the life of your vehicle. The 71-3540 intake system—part of the Blackhawk Induction™ line—includes a DRYFLOW® synthetic air filter which never requires oiling. The DRYFLOW® filter media is composed of lofted synthetic material, which—much like High-Flow Air Filter™ media—provides depth loading properties. Each filter is designed to strike a desirable balance between airflow and efficiency, provide a high level of contaminant capture, and outperform typical disposable paper air filters in airflow. Because they do not have to be re-oiled, servicing DRYFLOW® air filters is typically a quick and easy process. Even better—you get a blacked-out, stylish appearance in your engine bay. The K&N 69-3540TP and 71-3540 intake systems are engineered to incorporate factory mounting points and the factory mass air sensor. Installation can typically be completed in 90 minutes or less, and requires only simple hand tools. Detailed instructions are included in your kit, and installation videos for many vehicles are available on the K&N website. 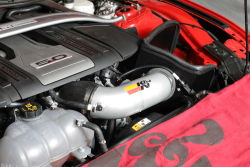 K&N performance air intake systems are protected by a guarantee—you will get an increase in horsepower and torque. 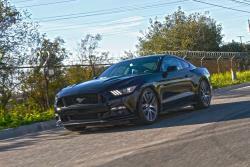 During dynamometer testing, a 2018 Ford Mustang 5.0L V8 with a factory air intake system was recorded at 418.2-hp at 7,000 RPM. After installation of 69-3540TP, the same vehicle was recorded at 434.2-hp at 7,000 RPM—an estimated increase of 16-horsepower. The torque also jumped from 286.9 lb.-ft. to 303.8 lb.-ft.—an estimated increase of 16.9 lb.-ft. at 3,085 RPM. 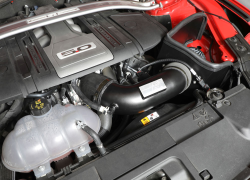 The Blackhawk Induction™ series intake also demonstrated estimated power gains during dynamometer testing—the same 2018 Ford Mustang 5.0L V8 with the 71-3540 system installed saw an estimated increase of 9.5-horsepower (at 7,002 RPM) and 23.2 lb.-ft. (at 3,024 RPM) over the stock intake system. 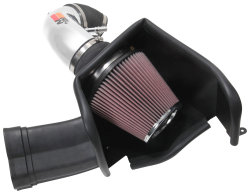 Visit this page to purchase the 69-3540TP air intake system, click here to purchase the 71-3540 intake system, or visit this link to explore other performance product options for your vehicle. Join the millions of customers who trust K&N to help them boost performance and protection in their vehicles!